Each time I create a blog post, I start with one tab in my browser. By the time I finish, I have multiple tabs open. This is why I take waaaay (way) too long working on a single entry. I constantly need to check something online. There's the usual buy links and book covers but the more time-consuming ones are what I'm going to share with you today. If you happen to do any of these, then WUHOO! I AM NOT ALONE IN THE WORLD! I can't be the only one who abuses Google, right? I can articulate myself just fine in the English language but sometimes I find myself needing some help from everyone's dear ol' friend Google. (There's always the print dictionary but come on...) I mostly check out spellings because I am not always on my A-game. Grammar? Sure, I can handle it. But spelling? Uh... *kroo kroo* And sometimes I come across words that are very unfamiliar to me. Take for example, bildungsroman. I was transcribing my audio copy of the blogger forum with Marie Lu I attended last year. 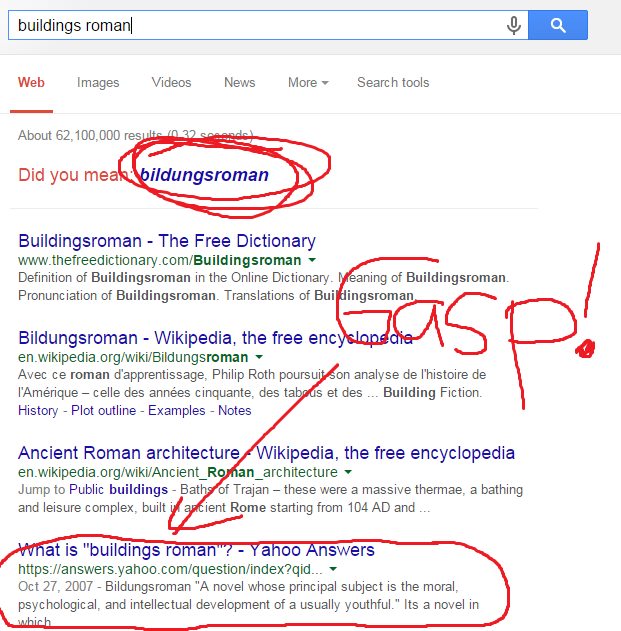 She said bildungsroman but to a non-writer such as myself, I thought I heard buildings roman. I was like, hey, wait a minute! That can't be right? I had to look it up and so I did. HEHE. I don't use GIF images all that much but when I do, my Google-ing skills are on fayaaar! Just kidding. Looking for GIFs to use isn't all that hard. Sometimes the most obvious string of search keywords works out well. This works out well for JPEGs too. I once searched Googled images for, "girl screaming at computer" That was nice. Do you do anything similar when you blog? Sound off in the comments!